We don't have any snow here. A relative has shared gorgeous snow photos of Colorado but no snow here in the Midwest or at least in our corner of Iowa. This is unacceptable for Groovy Girl. She believes snow is part of what makes Christmas magic. She loves pulling on her tall furry boots and heading out into the snow to play still. But the snow has to come for her to do that. She is the only one of my kids who loves winter weather. 1. 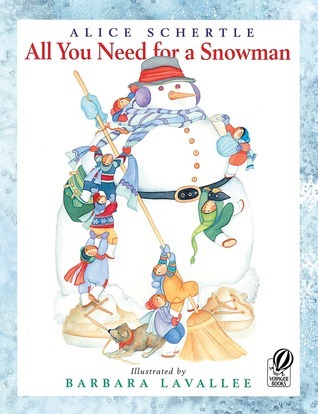 Alice Schertle's All you need for a snowman (2007): softly illustrated by Barbara Lavallee with flowing text that moves you forward from one page to the next. The pictures make you want to linger though. I love everything that Alice writes. The cover art above makes you want to flip inside. 2. 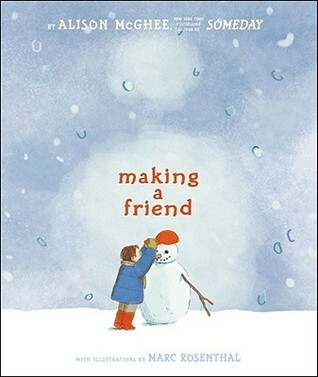 Alison McGhee's Making a friend (2011): Illustrated by Marc Rosenthal with soft wispy pictures and text that tells the reader the simple water cycle as the boy builds the snowman and watches it melt only to come back to life the next winter. Great for seasonal conversations as well. 3. 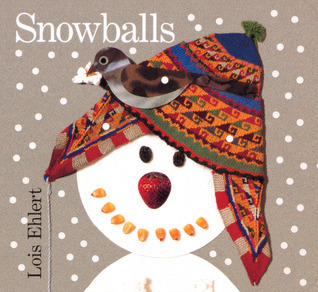 Lois Ehlert's Snowballs (2001): My classic go to story of a snow family taking on new life with a variety of crazy fabrics and household items. Kids love the end pages that shares all the items Lois' used to create her snow family of kids, dog, cat,mom, and dad. Will inspire you to grab your craft bag and head out into the freezing cold to create the perfect Ehlert snowman. 4. 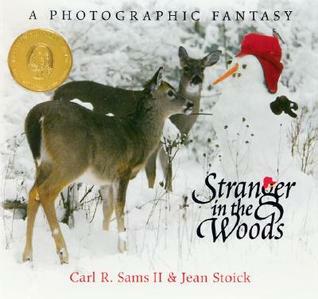 Carl R. Sams II and Jean Stoick's Stranger in the woods (2000): With exquisite photographs we see woodland animals all trying to discover who has come through the woods. The lyrical text is filled with kid-catchy sounds making the pictures come alive. I love reading this aloud with the chick-a-dee-dee-dee and the stuttering porcupine. The mystery is bigger than just the snowman though so keep turning the pages. I love ending with a few suggestions on how students could help feed local animals through winter. 5. 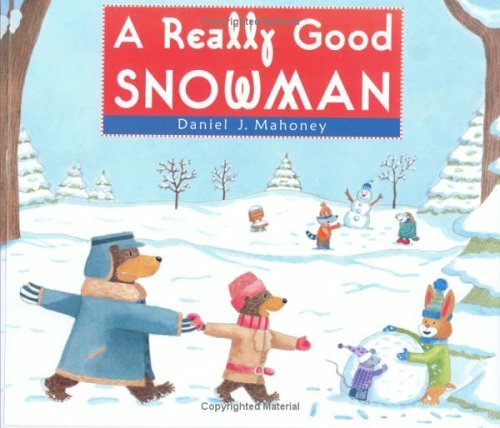 Daniel J. Mahoney's A really good snowman (2005): I like this book because it's more than just a snowman story. It's about family and sticking together. Jack wants to build a snowman with his friends for the annual snowman competition held at the town park. His little sister wants to help but they send her off to do her own thing. When Jack realizes she needs his help he leaves his friends behind to stick with his sister. It's a lovely story, cute illustrations, and a good lesson in teamwork. 6. No snowman post of mine would be complete with out mentioning my favorite snowman movie...Jack Frost with Michael Keaton as the aging rocker who is killed in an accident after playing a gig on Christmas Eve. Sounds tragic and their are tearful moments but the story is a light-hearted look at a young boy dealing with grief and a father-turned snowman dealing with leaving his family behind. Love to watch it every year.